Ford, whose sales in California were lackluster in recent years, is undergoing a resurgence in that state with improved vehicles, sees five new electrified vehicles being rolled out this year as a key to increasing market share in the key automobile market of California. Ford Motors is beginning the rollout of information, and later cars, that will be a five pronged assault on Toyota and Honda for market share, especially in California. Environmentally conscious Californian's go for clean cars like Toyota's Prius, and most of the electric vehicle sales have been in California. Ford, whose market share in California was weak a couple years ago, is looking to gain market share which means beating Toyota and Honda for sales in that state. Ford's vehicle electrification strategy, called the Power of Choice, is a large part of the plan to take market share. That electrification strategy is due to have a major rollout at the end of this year as four more electrified vehicles join the Ford Focus Electric. When Ford discusses "electrified" vehicles, or the "electrification" of vehicles, they do not mean solely "electric" vehicles of the sort that run only on battery power. Instead the term refers to any vehicle with any degree of electric assist, and includes a range of technologies from mild hybrid, to regular hybrid, to plug-in hybrid, and of course all electric battery powered vehicles. Why California? That state is the leading automobile market in the U.S. with 10% of nationwide sales. California's market is a little different than the rest of the country. For example the Californians buy more cars than trucks (60% to 40%) whereas in other states it is a more even split. Hence, the venerable F-150 won't carry California as it does in other states. In the last couple years Ford's smaller cars, the Fiesta and Focus, have seen sales take off in the state, and the company plans to make a marketing push to raise sales of the Fusion. Another difference in California is the strong focus on environmental friendliness, and is in part the source of Toyota's and Honda's strength in the state. C-MAX Hybrid and C-MAX Energi plug-in hybrid: These two cars originate with the C-MAX on sale in Europe since 2010, and have sold over 144,000 units to date. In Europe they are available with gasoline and diesel drive trains, but in the U.S. the C-MAX will be Ford's first dedicated hybrid-only car line. The C-MAX Hybrid and Energi will differ by the precise design, with the Energi having a longer electric driving range and the ability to plug the car in to recharge the battery pack. The C-MAX Hybrid is projected to achieve 47 miles/gallon city fuel efficiency, at least 3 MPG better than Toyota Prius v while offering more performance. and to have a $1,300-lower base price (47 mpg city and 44 mpg highway for the C-MAX Hybrid, 44 mpg city and 40 mpg highway for the Prius v). The C-MAX Energi is projected to be rated for a 20 mile electric-only driving range, versus the 12 miles for the Prius Plug-in, and offer a 550 mile total driving range. Focus Electric: The Ford Focus Electric is already in production, and has been EPA certified with a 110 MPGe fuel efficiency, that beats the Chevy Volt and is competitive with the fuel efficiency of other electric vehicles. Its driving range is also competitive with other electric cars, and with a 6.6 kilowatt on-board charger offers a faster charge rate than other electric cars, except for the Coda and the Tesla Model S that is. Fusion Hybrid and Fusion Energi plug-in hybrid: The 2013 Ford Fusion will be the first of Ford's automobiles to receive the full Power of Choice treatment, and will be available with an EcoBoost engine, or in Hybrid and Plug-in Hybrid models. The EcoBoost version is expected to deliver best-in-class four-cylinder non-hybrid fuel efficiency of 26 MPG in the city and 37 MPG on the highway. The Fusion Hybrid is expected to deliver best-in-class fuel economy of 47 MPG in city driving and 44 MPG on the highway, beating the 2012 Toyota Camry Hybrid by 4 mpg city and 5 mpg highway. The Fusion Energi (plug-in hybrid) is expected to deliver more than 100 MPGe, but Ford has not yet release detailed specs. If the Energi is certified for 100MPGe it will beat the fuel efficiency of both the Chevy Volt and Toyota Prius Plug-in by a wide margin. A common thread in Ford's press releases concerning these vehicles is how they are beating Toyota on the numbers. Higher fuel efficiency, longer range, than not just Toyota of course, but also Chevy and Honda. Will fuel efficiency numbers be the whole story? Ford is also focusing on other aspects of the vehicles, such as the styling of their cars, and an effort to develop biomaterial substitutes for materials used in the passenger cabin. Ford's sustainability efforts are more than just fuel efficiency, and this may, or may not, be important to automobile purchasers. 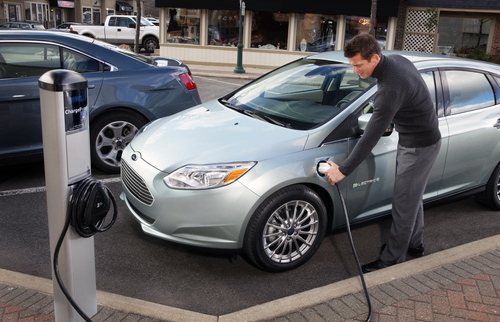 "Ford's electrified vehicles offer a great combination of efficiency, performance, technology and affordability that we believe will help spur adoption of these advanced vehicles," says Kevin Layden, director, Ford Electrification Programs and Engineering.